What is the place of chlorophyll-a in the Marine Strategy Framework Directive (MSFD)? Under the MSFD assessment framework, chlorophyll-a concentration in the water is specifically mentioned as an indicator under the Eutrophication Descriptor (D5), although it may also be potentially used to support other indicators under other descriptors, such as phytoplankton biodiversity (D1,D5), Harmful Algal Blooms (HABs) (D5), for food webs (D4), or even as tracer for hydrographical features (D7) such as eddies, upwellings or currents. However, relationship with those descriptors is less straightforward. In the recently approved Commission Decision 2017/848, chlorophyll-a is considered as a primary criterion ( D5C2) that should be used to ensure consistency across the European Union. The CHL4MSFD Service will focus on chlorophyll-a concentration as an indicator for the Eutrophication Descriptor (D5). 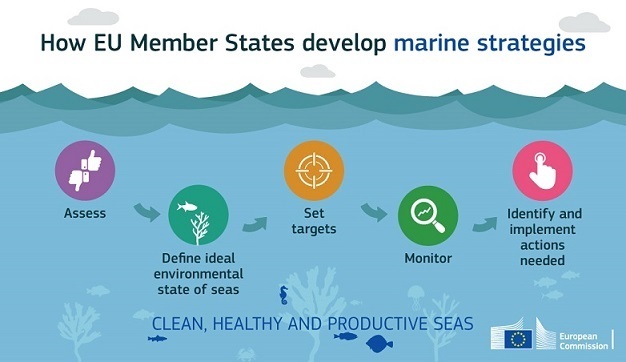 What does the Marine Strategy Framework Directive looks for? An initial assessment of the current environmental status of national marine waters and the environmental impact and socio-economic analysis of human activities in these waters (by 15 July 2012). The determination of what GES means for national marine waters (by 15 July 2012). The establishment of methodological standards, environmental targets and associated indicators to achieve GES by 2020 (by 15 July 2012) according to 11 key themathic Descriptors (Commission Decision, 2010). The establishment of a monitoring programme for the ongoing assessment and the regular update of targets (by 15 July 2014). The development of a programme of measures designed to achieve or maintain GES by 2020 (by 2015). The review and preparation of the second cycle (2018 – 2021). These Marine Strategies must be kept up-to-date and reviewed every 6 years: the first cycle began in 2012, and the second assessment cycle will start in 2018. More detailed information can be found here.